Just last week a friend was on the road when his laptop's power flaked out. Luckily, he was able to open up the case and find that a stuck fan was allowing his system to overheat. He was able to kick-start the fan and get it spinning again, so he could get back to work (albeit after doing some quick backups). If you're a DIY (do-it-yourself) type, or concerned that you may need to do similar emergency surgery on your computers or electronic devices, then can get prepared with a toolkit like the Newer Tech 14-Piece Portable Toolkit. This has a variety of tools that you'll need to open both laptop computers and small electronics, conveniently packaged in a zippered nylon case that has a padded interior with cutouts to keep the tools in place. The tools start with tweezers and a scissor clamp, plus nine screwdrivers with hardened, magnetic blades: straight 1.8 & 3.0mm; Phillips #00 & #2; Apple Pentalobe 1.2mm; and Torx T5, T6, T8, T10. The Portable Toolkit also includes two nylon pry tools ("spudgers") and a nylon probe / stick (with point & blade). These are designed not to scratch devices, but are disposable since the edges wear down with use. For more focused work to open recalcitrant electronic devices, you can use the Newer Tech iSesamo Pry Tool. The iSesamo is designed to pop open devices by slipping between their panes, including batteries, LCD displays, touch screens, and internal components. It has a thin, flexible, and rugged professional grade stainless steel blade, with a rubber handle for a secure grip. The Newer Tech 14-Piece Portable Toolkit is available for around $17, and the iSesamo Pry Tool at around $9. It would be cool to fill your home with music, playing in every room as you move around. I've seen houses like this, with speakers embedded in the walls, from living room to kitchen to master bath -- and using products from Sonos. Sonos has developed an impressive line of wireless HiFi products, with wireless speakers including a sound bar and subwoofer, audio bridges from your existing stereo system or to your existing speakers, and network bridges to form a dedicated home audio network. Yet while the vision sounds great, starting down this path seems like such a huge commitment. 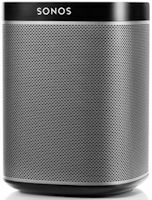 Which brings us to the Sonos PLAY:1 compact wireless speaker -- a mini yet powerful speaker that delivers the promise of in-house audio starting at $199. The PLAY:1 speaker is definitely compact at 6.36 x 4.69 x 4.69 inches, and solid at 4.08 pounds. It features one tweeter and one 3.5" mid-woofer, each with dedicated amplifiers. And it puts out clear sound with volume to fill multiple rooms of a house. As a bonus, it's also humidity resistant, so you can use it in a bathroom with a running shower. And it has dedicated controls on the top for direct access, to play/pause, skip tracks, and adjust the volume. The important detail here is that the wireless in the Sonos system is not based on Bluetooth, limited by the 30-foot range from a paired phone or tablet. Instead, Sonos uses your home Wi-Fi network, which means you can control a speaker from across the house, and control each speaker from multiple devices. You and your family then can use the Sonos apps on each of your devices, or the desktop software, to control the playback and add new music to the queued playlist for the speaker. Plus you can add additional speakers and control them from one device -- to play two as a stereo pair, synchronize playback across different rooms, or choose to play different music in each room. You then can stream selections from your entire music iTunes and Amazon music libraries (including up to 16 Macs, PCs, and network storage devices), as well as popular music services and Internet radio (including Pandora, Spotify, Google Play, and SirusXM). The Sonos PLAY:1 wireless speaker is more than an entry-level starter product -- It's a great stand-alone device to bring a shared music experience to your house. Although it's admittedly also a tempting entry into the possibilities of whole-house audio. 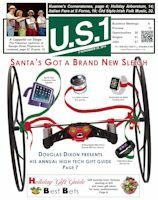 'Tis the season for Holiday Gadgets, and my annual coverage this year focuses on "wearables" -- fitness bands and smartwatches. The industry is making big bets that 2015 will be the year of the smartwatch -- with the impending arrival of the Apple Watch ("Everything we think a watch should be"), the arrival of the new Microsoft Band for "fitness and productivity," continuing developments from Google Android Wear ("Information That Moves With You"), and the expanding line from Samsung Wearables, including the Samsung Gear S "watch phone." So will you soon be moving from carrying your electronics to wearing them, and making phone calls through your wrist? Maybe... It certainly is handy to be able to just glance at your watch to quickly check who is calling your phone, or to see a reminder of an appointment, or to skim an incoming text message. It's even better to realize that you'll never again be embarrassed by having your phone ring at a meeting. Now you can just keep your phone silenced, and stashed in your pocket or bag. Then when you feel a vibration on your wrist you can just casually glance at your watch to see what's happening, instead of rudely reaching in your pocket and fiddling with your phone. My Holiday Gadgets coverage also includes wireless accessories, with wireless audio, wireless speakers, portable power, and other fun accessories for your portable devices. Entries posted to Manifest Tech Blog in November 2014, listed from oldest to newest.